L.A.’s iconic Mexican fan palms get a lot of attention, but the coast live oak has long been the unsung hero of our urban forest. The area’s most common native tree, it sustained indigenous inhabitants with its edible acorns, and early settlers used its wood to (quite literally) fuel L.A.’s development. Even today, the oak, which can live more than 250 years, doesn’t just pretty up the cityscape. Here, we get to the root of one of L.A.’s most venerable trees. Accustomed to going without rainfall for almost nine months a year, the evergreen has evolved some innovative water-saving techniques. Its thick leaves are small and cupped inward to reduce exposure to the sun, and downy hairs on their undersides help hold on to precious moisture. 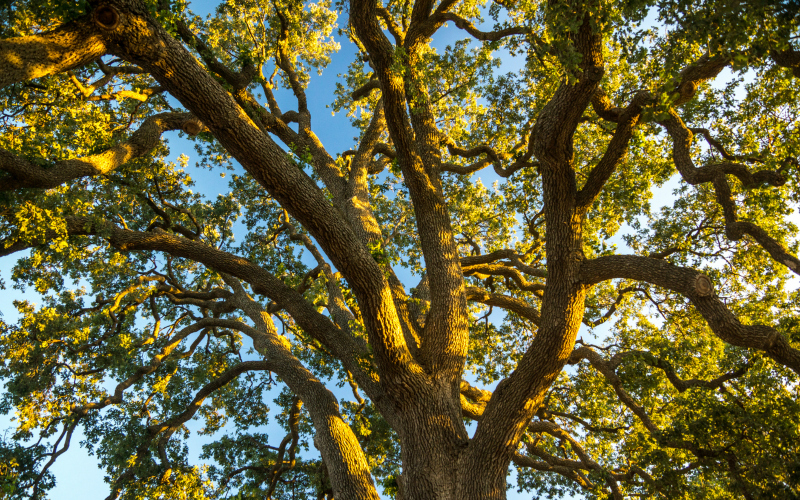 Encased in a silvery outer layer that grows, on average, an inch thick, the oak is able to withstand most low- to medium-intensity fires with its vital inner tissue intact, enabling new branches to sprout later. The tree’s irregular shape makes it a poor source of lumber, but Spanish and American settlers often used the wood for tinder. Many more oaks were cut down to make way for construction. So in 1982, the city enacted the Protected Tree Ordinance to help safeguard native species. When fallen leaves and twigs decay, they create a rich, porous soil that soaks up water like a sponge. The effect is threefold, helping to reduce flooding and recharge the city’s groundwater while rehydrating the tree. With a crown that can reach 70 feet in diameter, the tree is uncommonly good at providing shade. Aside from offering a cool refuge from the sun, oaks and their ilk can help mitigate the urban heat-island effect, caused in part when dark buildings and pavement absorb sunlight, raising ambient temperatures. The coast live oak supports more than 300 species of plants, animals, and bugs, including the invasive polyphagous shot hole borer. The Southeast Asian beetle tunnels into bark to lay its eggs, introducing a fungus that disrupts the flow of food and water in the trees. Also fairly new here is sudden oak death syndrome, a separate scourge caused by a fungus-like organism.